Originally uploaded by decatur library. The day I headed to DC for CIL I had the opportunity to present a session on our distance learning library initiatives at the Innovations 2006 conference here in Atlanta. For those who aren't familiar, Innovations in a conference of cool things people are doing in the community college world. The session went quite well, people asked questions etc. We had a good discussion on how to make sure distance learners get the library resources they need in a courseware environment. 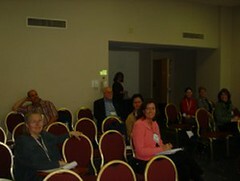 One thing that I found interesting was the fact that most of the attendees were librarians. When my former colleague Jennifer Link and I did an earlier version of the presentation last year at the Southeastern Scholarship Conference on E-Learning the audience was made up of mostly DL faculty and administrators and that was the audience I was expecting at Innovations too. I had to do a little on the fly verbal tweaking, but it still went well. 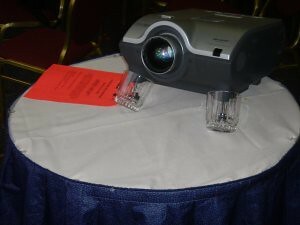 And for some reason my projector was propped up on drinking glasses! Guess that was the solution when a previous presented needed help. I also had the chance to attend some good sessions, primarily on teaching and learning in the online environment. So it was a pretty useful experience. Greetings. So I was at the Computers In Libraries conference last week, which was awesome, and I met a lot of really cool, interesting people, many of whom blog. A few of them asked me why I don't have a personal blog and in retrospect the excuses I gave for lack of blogging we're pretty lame. So I'm going to give it another shot. Might not end up being the most prolific LIS blog in the world, or the most informative, but I am going to try to talk about some of the things I'm working with at MPOW and elsewhere. And just random LIS and tech stuff I'm interested in.